After the seeming sexual assault of a drunk teenage girl is murkily caught on film, the victim searches for answers in a movie that doesn’t believe in them. The cellphone video at the center of Pippa Bianco’s “Share” is hard to discern, which is just how the unsettling writer-director wants it. There’s high school basketball player Mandy (Rhianne Barreto), blackout drunk on a tile floor. And boys — who? how many? — mocking her as Mandy’s crush A.J. (Nicholas Galitzine) pulls down her pants. In the morning, the 16-year-old wakes up bruised on her front lawn, but silently convinces herself that everything is fine … until her best friend Jenna (Lovie Simone) forwards her the footage. “But it’s funny!” says A.J. “Honestly, it’s not a big deal.” Mandy is unconvinced. What comes next is everything you might expect: the justice-seeking parents (Poorna Jagannathan and J.C. MacKenzie); the stumbling police report; the suspension of several superstar athletes; the glut of news cameras; the hateful texts from classmates; and even a fist-fight at the local superstore. (“Share” takes place in a suburb so small that the 7-Eleven is the center of the social world.) Bianco hews to the sad melody of a community torn apart by scandal. Yet, her script skips past the big, dramatic scenes we’ve already seen in other girls’ stories, like the coach kicking Mandy off the team, or the principal suggesting she’d be better off home-schooled. Instead, it simply shows the after-effect: Mandy, alone at home on a school day making her own lunch when she should be with her jock friends at the cafeteria, or parrying the awkward advances of Dylan (Charlie Plummer, saddled with a flimsy character). And rather than showing us the bullying threats on Mandy’s phone, the director just lets us hear the continual message alerts, a fusillade of pings that the girl ignores. “Share” is fragmented and disorienting, though one suspects that confusion is perhaps Bianco’s point. Like Mandy, we’re forced to spend the film grasping for facts. Barreto’s performance is more frustratingly passive than passionate. Mandy’s not a crusading hero but a quiet kid who becomes so isolated she teeters on the edge of depression. All she wants to know is what happened that night — to reclaim a missing piece of her life, even if it takes hypnotherapy — as though, once she’s regains her autonomy, life can get back to normal. But her desire for privacy and independence clashes with her parents’, who mostly want to see the boys get punished, though for different reasons. Mandy’s father is furious to realize that the idea sexual assault is real. Her mother knows it is — and Jagannathan’s eyes are just damp enough to make us wonder what might have happened to her. “You’re lucky you have proof,” she says to her daughter. Barreto’s face is, as ever, inscrutable, but she definitely doesn’t feel fortunate. Bianco is a sucker for a beautiful shot, even if it’s a bit nonsensical, like a dark computer lab of kids watching an old Western on a projector while their monitors are aglow with distracting screensaver fireworks. (Wouldn’t they just turn the computers off?) Her main visual motif revolves around cars and hazy headlights, ideas of motion that underscores how Mandy’s days have stopped once her parents took her to the police station. The headlights are one of Mandy’s unconscious memories of someone driving her home. But they might be a way for the director to show how high beams can illuminate a sliver of the night but make the shadows even murkier — or the way that one attention-grabbing theory casts every other explanation aside. “Share” wants to chip away at any certainty that outsiders know what what’s best for a victim, which is especially important for victims as public as Mandy. Bianco is open to the idea that Mandy’s instinct to ignore the video is just as valid a reaction as her parents’ insistence on doing what’s “right.” By the end of the film, however, you wish Bianco would display her cynicism in full, to shine a spotlight on the dissatisfying truth she seems to believe: that justice is different than healing. But like that crucial cellphone video, “Share” obscures its true anguish. The post Sundance Film Festival – Variety appeared first on Epeak World News. 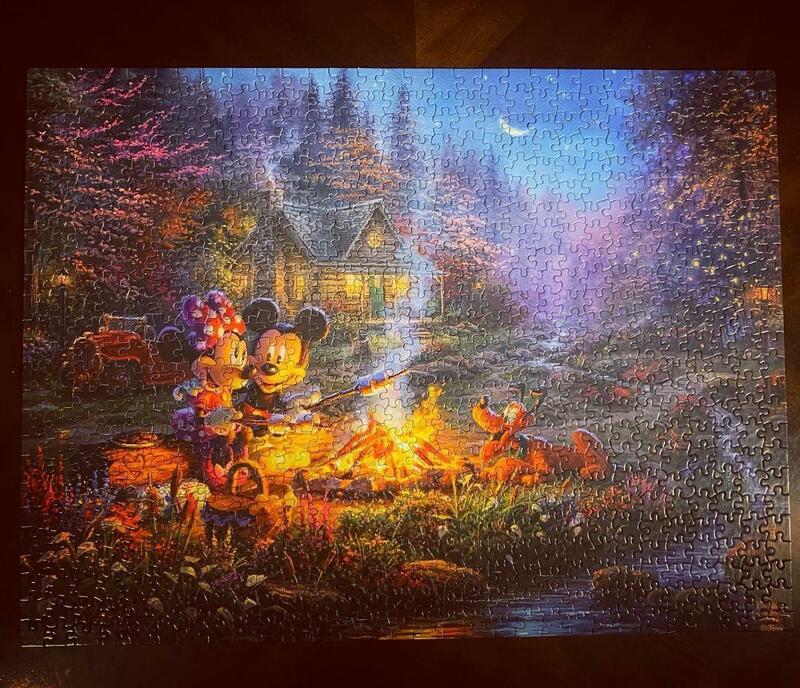 My wife and I finished our first puzzle together. It had to be Mickey & Minnie.